The Gulf of Poets, formally known as Gulf of La Spezia, is a deep and wide bay on the eastern tip of Liguria’s coast. This beautiful gulf stretches between the sea villages of Portovenere and Lerici. The larger town of La Spezia lies in the middle of the bay, and it is the provincial capital of this part of Liguria. The first and most evident reason is that the dramatic scenery here is a feast for your eyes and soul. The name itself stems from the inspiration that the area has had on poets and artists who have been struck by its beauty. Among them: writers David Herbert Lawrence and Percy Bysshe Shelley, writer and painter George Sand, and poet Lord Byron. Even the early-Renaissance painter Sandro Botticelli created one of his most iconic masterpieces, the Birth of Venus, after visiting the local village of Fezzano and meeting Simonetta Vespucci whom he chose to represent the goddess in the painting. According to some art experts, the bays he depicted on the right-hand side actually represent the Gulf of La Spezia with the promontories of Fezzano, Pezzino, Varignano and even Palmaria Island. Secondly, great food and wine. A healthy Mediterranean diet with fresh local fish, vegetables and fruit, homemade pasta and genuine Ligurian recipes, is just what you need to make the most out of your Italian vacation. When traveling to Liguria, most visitors immediately think of two typical products: pesto and focaccia. But there are many more local delicacies such as Mitili (Mussels), anchovies, Extra Virgin Olive Oil, Sciachetrà DOC Wine – among others. Read more in Typical products from Cinque Terre & Portovenere. 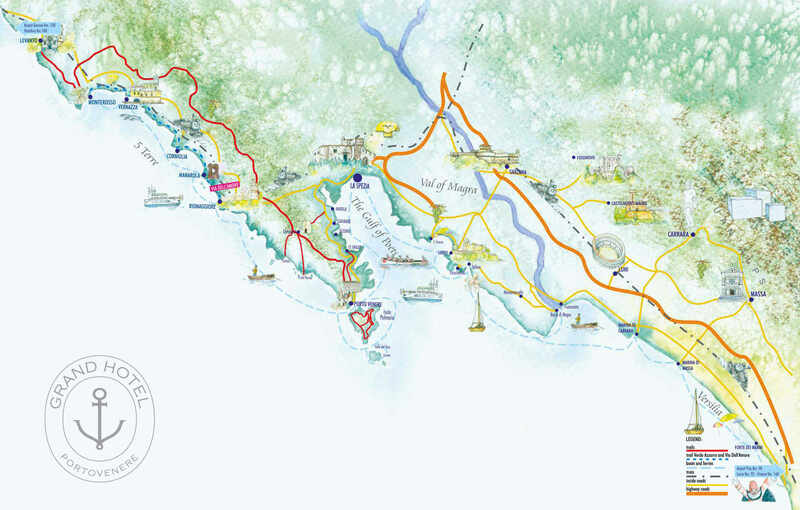 Thirdly, the Gulf of Poets offers you a strategic location that allows you to easily move around and visit the mesmerizing territory by foot, boat, car and/or train. If, for example, you choose a central location such as Portovenere for your hotel, you can reach the islands of Palmaria, Tino and Tinetto in 5 minutes; Lerici, La Spezia, Riomaggiore and Manarola within 30 minutes; Corniglia, Vernazza, Monterosso and Sarzana within 50 minutes; while Portofino and Versilia are 2 hours away. For more on each mentioned town, and for even more surrounding attractions, visit “Portovenere: The Destination”. Click on the hyperlinks to read specific blog articles dedicated to each activity or attraction. CULTURE & HISTORY: Visit local castles, museums, artisan workshops and churches. HIKING and CYCLING on Palmaria Island and across the Porto Venere Regional Natural Park. SAILING: Whether you choose a small fisherman’s boat or a luxury speed vessel, sailing is the best way to explore the area from the Cinque Terre to every corner of the Gulf of La Spezia. DIVING in the protected marine area of Portovenere. FOODIE ACTIVITIES: wine tastings and visits to organic vineyards, and cooking lessons. SHOPPING: Choose between the typical “corso” in a small village and the fancy streets of Portofino and Versilia. WELLNESS & SPA: Relax and enjoy beauty treatments at Portovenere Wellness Center. EXCLUSIVE TOURS: visit Carrara and venture into the marble caves that have provided the foundation for masterpieces such as Michelangelo’s David, or book a boat tour that includes a visit in the oyster farms of la Spezia. VILLAGE HOPPING: visit the lovely hamlets along the bay – Portovenere, Le Grazie & Fezzano, La Spezia, Lerici, San Terenzo, Tellaro & Fiascherino – and inland towns like Sarzana and Luni. The ideal seasons for visiting the Bay of Poets are spring and autumn, when there are less tourists and hotel rates are lower. Some parts of the Bay of Spezia are quite packed during summer, especially the villages of Cinque Terre. You can learn about seasonal activities in the following articles: Spring Activities and Autumn Activities in and around Portovenere. Nearest airports; how to move by car and where to park near Cinque Terre; taxis and buses – learn about all means of transport in the Gulf of Poets.